The duct blaster is an essential tool for building homes with energy-efficient duct-work and finding leaks in existing ducts. Leaky duct-work wastes energy. The only way to know if your home’s duct-work is leaky or tight is to measure its leakage rate with a duct blaster. A duct blaster is a tool that pressurizes a duct system. The pressurization exaggerates the duct’s air leaks and makes them easier to measure and locate. Every duct system leaks, and that’s why we perform duct blaster tests—to measure the duct leakage rate. Although homeowners would never put up with leaky plumbing pipes, they traditionally have been willing to accept leaky ducts. While water damage is frequently obvious, the damage caused by leaky ducts is more subtle but equally detrimental. Leaky ducts not only waste huge amounts of energy, they can also cause occupant discomfort, moisture, dust and mold problems, and allergic and asthmatic symptoms. Who needs a duct blaster test? 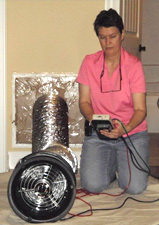 A duct blaster test is useful for new construction and for existing homes. If you are building a new home, the best time to do a duct blaster test is after the ductwork has been installed but before the drywall is hung. If the test reveals major problems, the leaks can be more easily fixed at that point than later on, especially if some of the ductwork is located between floors. A duct blaster test is sometimes required for new construction as part of local building code. It is also required for certain home labeling programs, but anyone building a new home can benefit from the test by locating and eliminating air leaks in their duct system to improve occupant comfort and reduce energy consumption. For existing homes, a duct blaster test can be required for certain community rehabilitation programs, but an existing home is generally tested simply to find out just how leaky the ducts are, and to help locate and stop the leaks. It is important to know that leakage measured using a duct blaster represents the total leakage of the duct system, both to the exterior (attics and crawlspaces) and to the interior (conditioned space). A blower door is often used along with the duct blaster, to allow duct leakage to the exterior to be isolated and measured. This is a very important distinction with respect to duct leakage. If any ducts are located in an attic or crawlspace, leakage will have a much bigger impact on energy loss. Who can do a duct blaster test? A duct blaster test should be performed by a qualified individual. For code compliance, the qualifications will vary by jurisdiction. For home labeling programs, the individual must be a certified HERS Rater and the duct blaster equipment must be calibrated annually by a third party vendor. The staff at Green River are experienced RESNET Certified HERS Raters. We are trained and certified to perform duct blaster tests and interpret the results, helping builders to tighten up the duct system during the construction process, attain code compliance, and satisfy home energy labeling program test protocols for duct tightness. 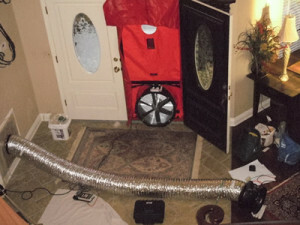 Call or email us today to schedule an appointment to conduct a duct blaster test! How can builders benefit from duct blaster testing? Give us a call at (865) 919-7464 or contact us online to schedule a duct blaster test today!